Hi everyone! I'm back with another Five Friday Favorites post. 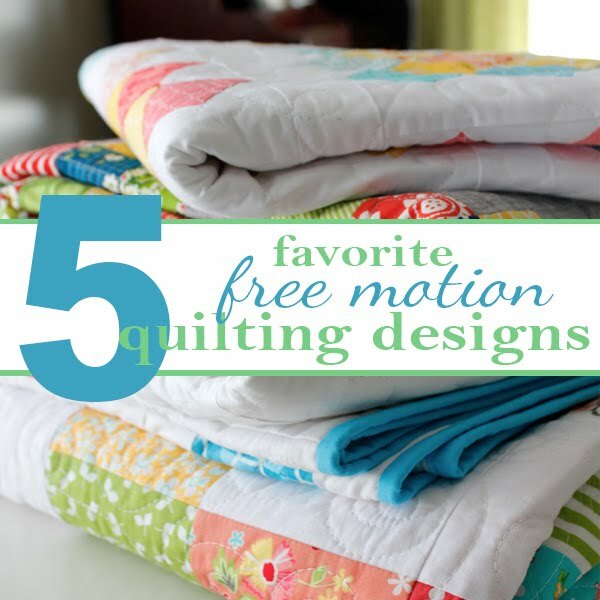 This time I'm sharing my favorite free motion quilting (FMQ) designs. These are the ones that are my go-to designs. My favorites and the ones I use most often. Any of these could be done on either a long arm OR a domestic machine. I promise! I know, because I've done them. First, a little about me. I started doing FMQ on a small Brother machine, bought from my local Costco. Man that little machine was a workhorse. It did everything I asked it to - I even quilted a queen sized quilt on that thing! Then I graduated to my Juki TL-2010Q - which has a much larger throat space and faster speeds. Then a few years after that I bought a used HandiQuilter long arm. I've tried all of these designs on several different machines, so I know that they work. If you can drop the feed dogs on your machine, then you can try FMQ too! Now, by no means do I profess to be an expert. You'll see in my photos that my quilting is far from perfect. 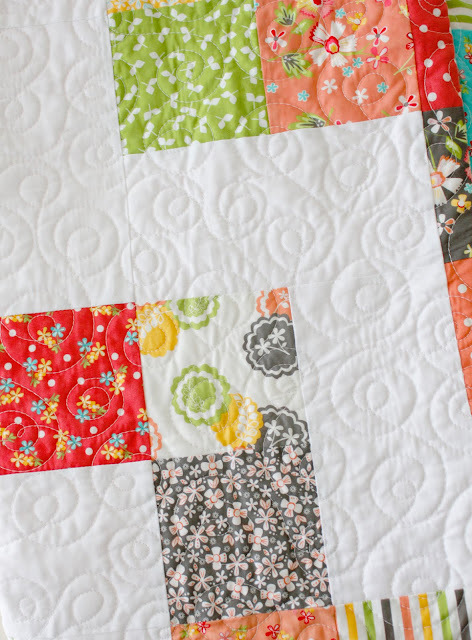 I've always enjoyed quilting my own quilts, and these are just my most-used and most-loved designs! This design is available as a pantograph from Urban Elementz but it's a fun one to do freehand! I love how this one flows as I quilt it. As I go, I try to keep each loop about the same size. As you can see, sometimes I'm better at it and sometimes I'm not :) But it's okay! That's what I love about the non-computerized quilting - it has personality! You can see more of the quilting on this quilt here on this blog post. This is a good one to have in your quilting repertoire. You can make it as dense or as open as you want. Work on "drawing" squares and rectangles - keeping your lines straight as you can, and angles at 90 degrees. I used this design most recently on my Mazed Quilt - it goes really well with the geometric aspect of the quilt! There's an awesome video here, where Angela Walters shows you how to do this design, as well as some other geometric ones. I hear some quilters refer to this as stippling, but to me this is more of a meandering design. If this were really dense then I would call it stippling. Like - REALLY dense. But I'm not the quilt police. So you can call it whatever you want. This still is one of my go-to quilting designs mostly for it's speed. And I don't have to think much about it as I go. When I started doing this one, I would try to make the shape of a puzzle piece - some convex curves and some concave. Keep that puzzle piece shape in your mind as you practice. 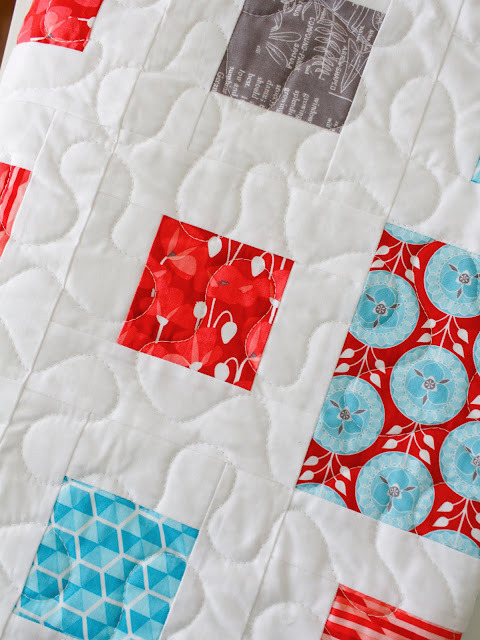 You can see more of the quilt and the meandering quilting here on this blog post. Recently this has been my favorite. I think I've used this one 6 or 7 times already this year. It's feminine but not frilly or complicated. This design is just some medium (nickel-sized) loops mixed in with some meandering. Add in as many or as few loops as you want, just try to keep the loops all the same size. I like to imagine I'm tracing around the edge of a nickel or a quarter as I go. 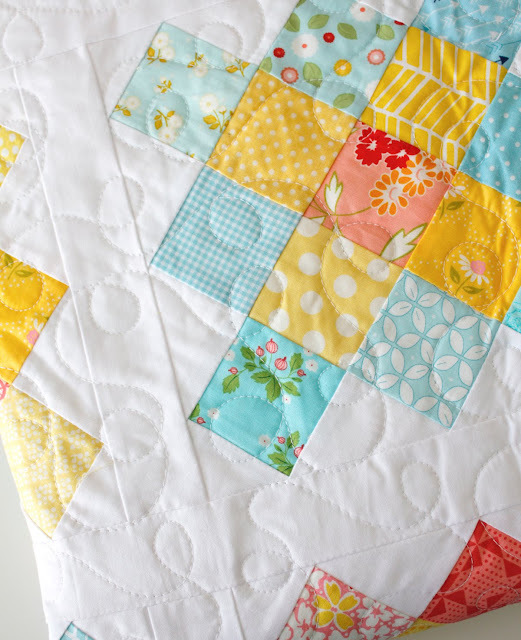 You can see more medium loop quilting here on this Little Miss Sunshine Quilt and here on my Little Ruby Quilt. This one is the most complicated design that I do free-hand. I call it Swirls and Shells, although it probably has a whole bunch of other names. This one takes me the longest to do, but I love it the most. If you're new to this one, I would recommend practicing just doing swirls, swirls and more swirls. Then try adding in a shell or two here and there. You can see some great videos that are similar designs here, here and here. And this video is great because she's using a domestic machine to make her swirls. You can see more quilts that use this design here and here. So there you go - my five favorite FMQ designs! If you're trying a design for the first time, my advice would be to practice, practice, practice! Get some paper and a pencil and try drawing it first. Get the feel of how you will move through the space. 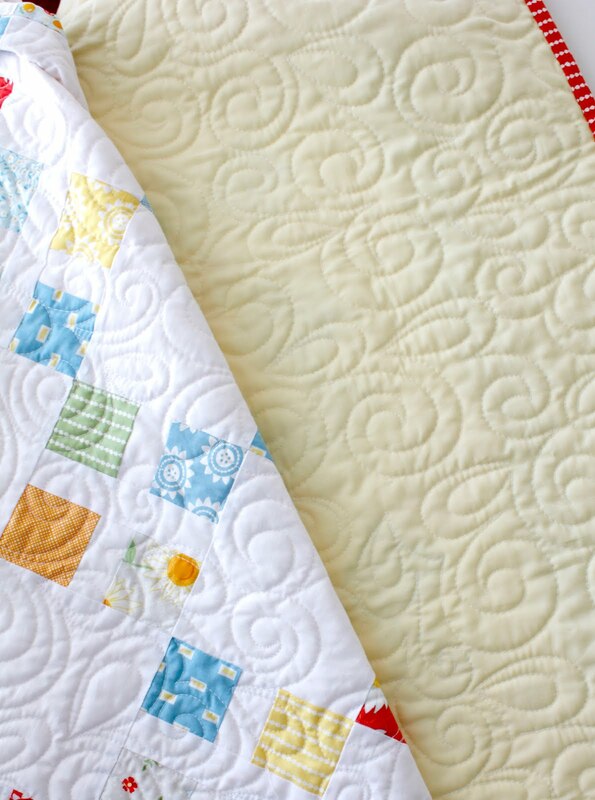 Then make some little sample quilt sandwiches (like 20" square or so) and try the designs out on the machine. For each design I'll go through 3 or 4 quilt sandwiches before I feel confident enough to move to the final quilt. Oh and before I sign off, I'd like to announce the winner of the Christmas Kitsch fat quarter bundle. Congratulations to Lorri! 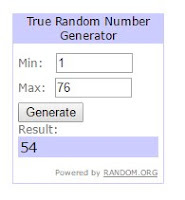 And thank you to all who entered! Thank you so much for your post and for sharing these quilting designs. 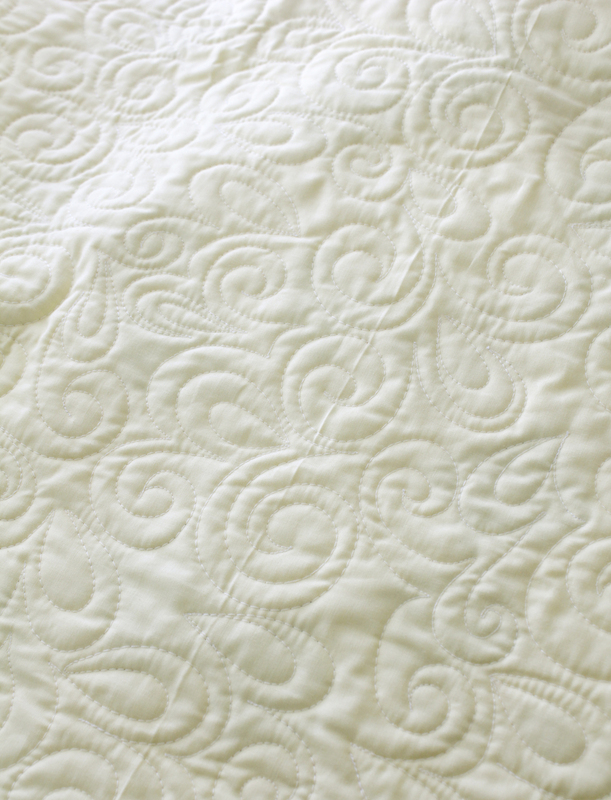 I'm still at the beginning, and dread when it comes to the quilting part of my quilts. If I can just outline my blocks, I'm happiest, but have started to free motion quilt. The video was great, and I'm ready to try again :)! Hi Andy! This is a great post! I love the swirls and shells pattern! And I have used the Mod Dotz many times too (although I don't usually do them myself). You're inspiring me though! Maybe I'll start practicing! I appreciate all the links to videos and more examples too. Thanks again! Thank you for sharing these, Andy! 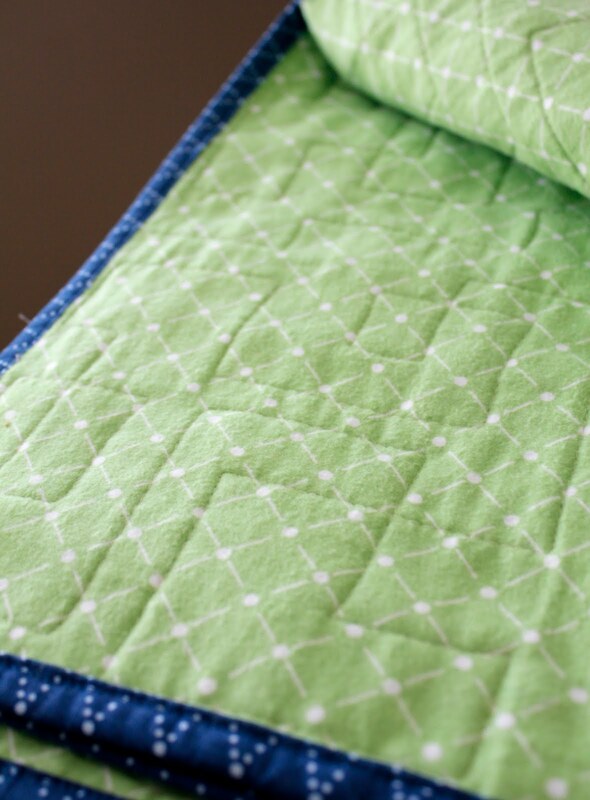 When it comes to the time for the quilting, I am often looking for something easy/simple to do in the way of a design. I've picked up a few ideas here! They all look so beautiful! I love my new fabric! Thank you!